How to Start a Cookie Business? Are you ready to start or grow your cookie business? I'm offering Online Live Classes on a variety of business topics! There are tons of videos and tutorials online and plenty of real-life classes about how to decorate cookies. There aren't a lot of resources on the business side. That's where I come in! ** I taught about this very subject at Cookie Con 2015. ** I've been teaching classes in Frederick, since 2014. ** I've had a successful cookie business since 2013 - including taking custom cookie orders and hosting cookie decorating classes and parties. ** I have over 11,000 facebook followers. I’ve learned a lot since starting my business. I’ve changed a lot of things too. I’m here to share my years of experience with you. I’m here to teach and encourage you to get you started and to help your business grow! I get emails every week from people asking questions about the business of cookies. I wish I could meet in person with every one of them. Now I can - sort of. I'd love to meet you in an online, live, video class! Can't meet me for a live class? Then purchase Ebooks on the topics that interest you! I'm offering private one-on-one live online classes - just me and you. Ask me ANYTHING! Contact me PRIOR to purchasing this option so that we can coordinate a date and time, as well as the topics to be covered. With the purchase of a private class, you will receive three ebooks of your choice. All online video classes are for groups and will be held using Zoom. You may join a class from PC, Mac, Linux, iOS or Android. A day or two prior to your class, you will receive your ebook and a link to download Zoom and to join your specific class. Check out Zoom's FAQs and test out your Zoom connection any time here. Please be sure that your camera, microphone and Zoom file are all working well together - long before the start of class. Classes will begin on time. There will be no refunds or exchanges if you don't attend, arrive late or have technical difficulties. Please read this policy page PRIOR to purchasing a spot in any online class. If the minimum number of students for a class isn't met, the class will be re-scheduled. Use coupon code 10off3 to receive $10 off the purchase of three online classes at checkout. Must purchase all three classes in the same transaction and use coupon code at check out to receive the discount. Discount will not be given as a refund at a later time. If you can't make the dates listed below, no worries. Most of the classes will repeat - approximately every 5 weeks. Once a class is held, it's updated to add in the next repeat date in the sequence. Please check back. Can't or don't want to wait for the next class? Contact me for a private one-on-one. All Online classes now come with a coordinating Ebook! Now you'll have all of the information from my lecture to refer to again and again! If you prefer - you can purchase JUST the Ebooks! I'll go over the highlights of the ebook during class. Then there will be time for questions and a quick bakery tour. Click on any photo below to learn more and to register. I want to meet you! Hear about my business, take a tour of the bakery, learn about my classes and ebooks, learn my unique way of attaching sticks to cookies, and time allowing - ask questions. How to get started in your cookie business with a commercial kitchen, set your policies, and decide on what you'll be offering. Private Consult - Weekdays, We'll put our calendars together to schedule. Let's chat! Your own private class - online or in person at the bakery. Ask me anything! How to organize your order taking process so that it's stream-lined and efficient. How to Grow Your Cookie Decorating Business. You'll be leaving with a LONG to do list! How to price to succeed! How to invoice and keep track of your finances. Ebook: How to roll, chill, cut, freeze, bake, cool, store dough - ready to decorate. Recipe Included. How to keep your cookie dough from spreading in the oven. Recipe included. Graph paper, geometry, and a calculator - necessary tools to figure out just how much icing to make in each color. Learn about four consistencies of icing - what they look like and what they're used for. Are you ready to start your business but have no idea how to build a website? I can help! Just wanted to drop you a note to tell you how much I enjoyed my private session with you today. I learned so much and I look forward to taking your lessons and creating a personal way to teach cookie decorating and cookie partying here in Pennsylvania. You were so kind to extend our class until 12! I hope to keep in touch with you and will share with you any success I have as I move in to my next level of "professional cookier"
You have been a great inspiration and I will be sure to pester you with questions that I forgot to ask today. I hope we will meet again soon." "I really enjoyed the class and learned soooo much. All the information is truly valuable, especially for someone who is just starting out like me. I want to take all the classes and probably will!" That was so much fun. I can't wait for the next class. I'm even going to sign up for 3 more!!!!!! "Hi Dotty. Thanks so much for the very informative class. Love that you made it so personal and informal." 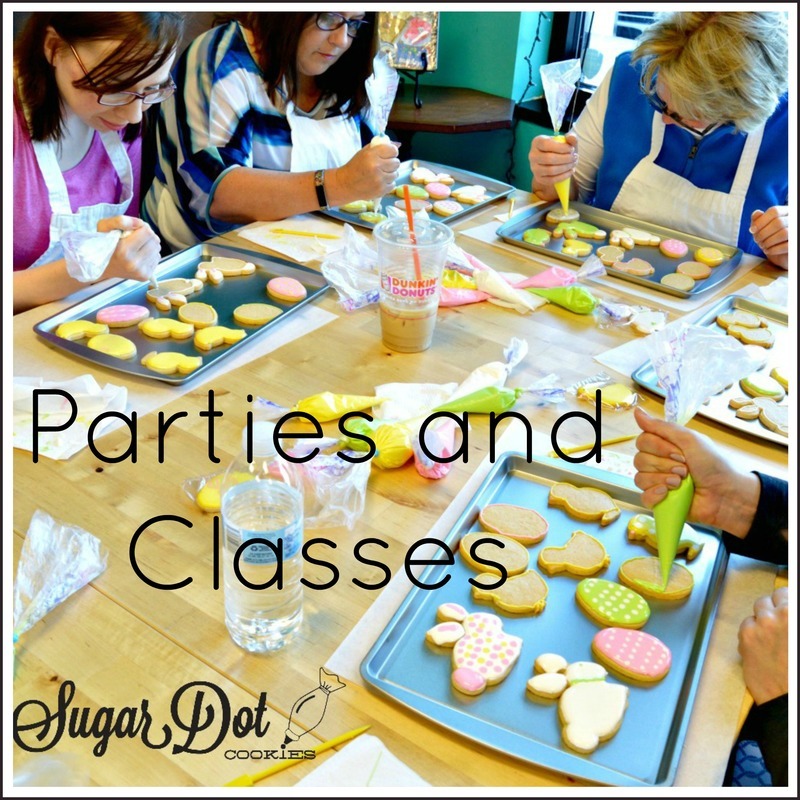 "Hi Dotty...I took your online class on how to host parties and classes as I am teaching my first class in about a month. I found the class to be very helpful and informative. Many of the questions I had about supplies, quantities, handouts/outlines, pricing, etc. were answered during the class. I feel much better prepared now! And your enthusiasm was great. I’ve taken some other online classes with instructors who were quite low key and, at times, even boring. I like your interactive approach much better! "
This bowl is AMAZING! You can easily grip the bowl while pouring. Click the photo to learn more. Use code SDC10 for 10% off. Would you like for me to come to YOU? I'd be happy to travel for a consultation. Just click on the photo below for more info. "Thanks for a great webinar last night on how to bag/platter/ship cookies. It was very helpful. I look forward to taking some of your other classes."